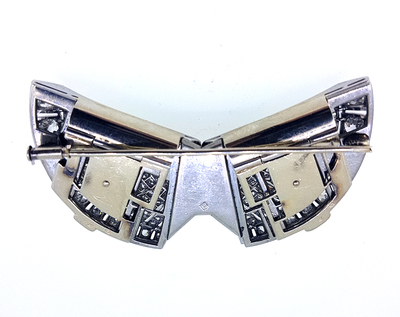 Item description: * An absolutely magnificent and important 1920s to 1930s Art Deco multi-construction double clip brooch by George Aucoc and the famous French Aucoc family jewelry firm. 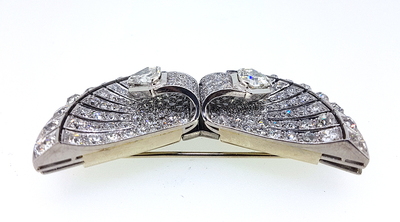 The brooch is executed in pierced heavy platinum in a somewhat Spanish hand fan design and comes with two different detachable 18K white gold frames to form an impeccable fashion design of a stylised butterfly and heart shapes. The goldsmith masterwork is exceptional and shows what true jewelry art is all about. 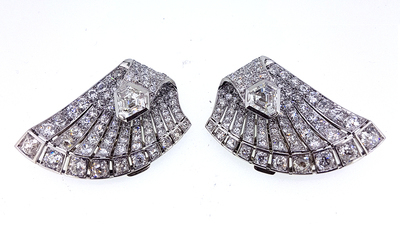 Each detachable clip is fully paved with graduated old European cut round diamonds of various sizes and adorned with a kite shaped diamond centerpiece. 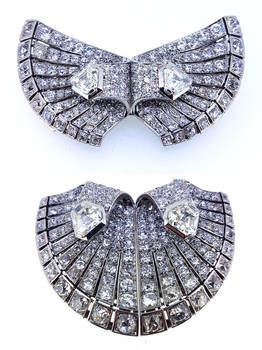 The kite shaped diamonds measure about 7.4x7.2x3.6mm and have an estimated weight of about 1.50 carats each. One of them is in the VS1 clarity range and the other is SI1. Their colors are H and J respectively. 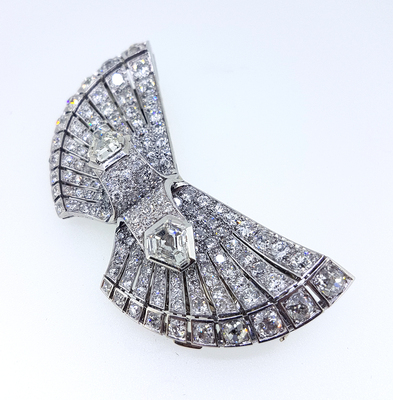 Besides the 2 large center stones, there is a diamond pave of a total of 202 diamonds set throughout the brooch with a combined estimated weight of another 16.00 to 17.00 carats. About 140 of these diamonds have average diameters in the 2.3-2.6mm range, while the remaining 62 pieces are much larger in sizes with largest ones reaching to about 0.65 carats. 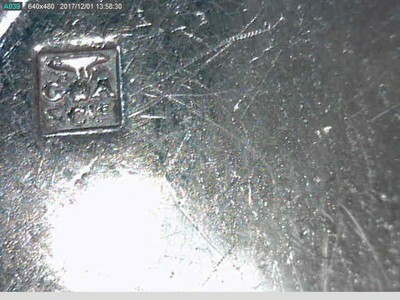 Total estimated diamond weight is in the 19.00-20.00 carats range. 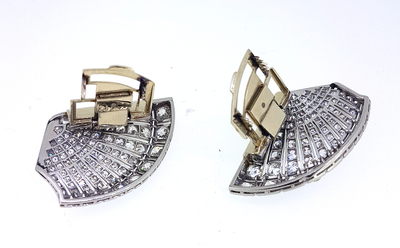 The brooch is quite heavy with its nearly 60 grams of platinum and 18 karat gold. 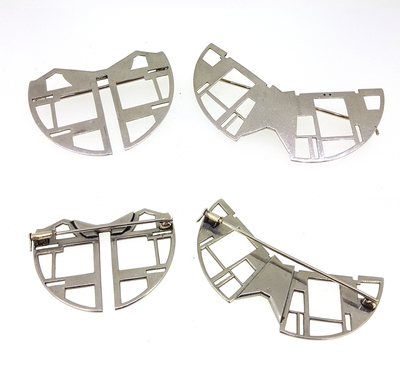 It is also quite large when set into its butterfly frame, measuring 66mm accross and 36mm tall, while it's heart shaped variation measuring 49x37mm. 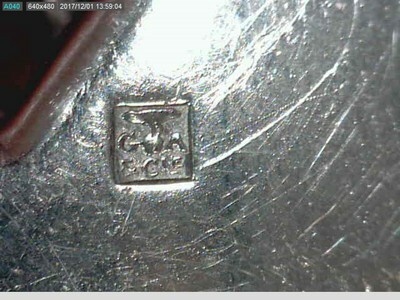 The brooch is hallmarked with French hallmarks for platinum and gold virtually on every part, as well as with multiple maker's marks of its creator Georges Aucoc (a Georges Aucoc et Cie. maker's mark with workmaster's initials). The present antique jewel is a real museum and collector piece and a true example of the essence of the Art Deco and Jazz era. 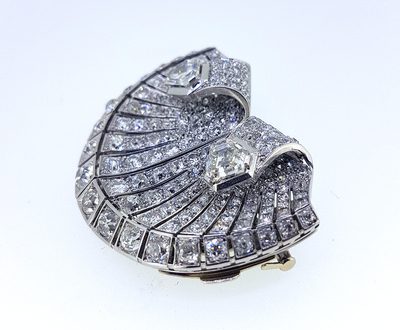 It has an emblematic design and exemplary workmanship that was typical only for the top luxury jewelry firms of that time like Cartier, Van Cleef & Arpels, Chaumet, Mauboussin, Fouquet and the like. At a certain point Rene Lalique has worked closely with the Aucoc jewelry form to also create some of the finest Art Nouveau jewels. Such genuine authentic period artist signed double clip brooches and jewels are seldomly seen on the market. 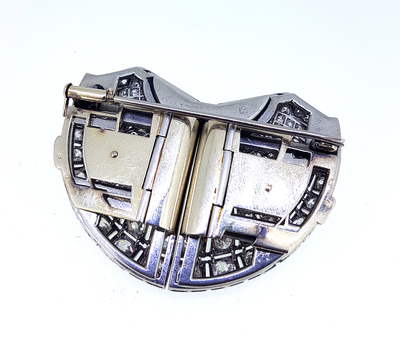 The brooch comes with a fitted antique Asprey, London case. Absolutely scarce collector object and one of the rarest 1920 - 1930 Aucoc Art Deco diamond brooches and jewels.